BC Khimki Moscow Region improved its chances of reaching the Top 16 from Group A by downing Panathinaikos Athens 67-79 in the Greek capital on Friday. Khimki improved to 3-2 and now faces a pivotal showdown against Fenerbahce Ulker at home next week. Panathinaikos dropped to 2-3 and hosts Group A leader Real Madrid on Thursday. Zoran Planinic led the winners with 18 points. 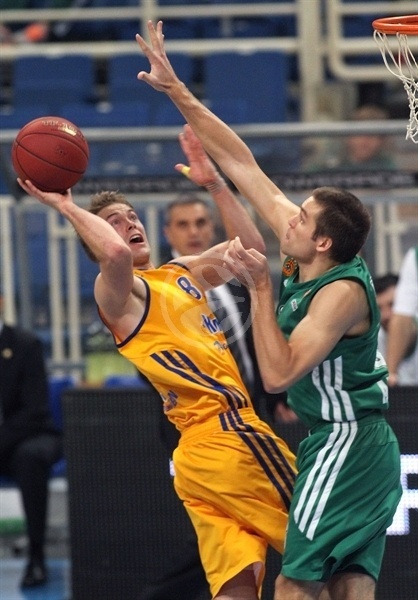 Kresimir Loncar added 14, Paul Davis had 13, Petteri Koponen 12 and Vitaliy Fridzon contributed 10 for Khimki. 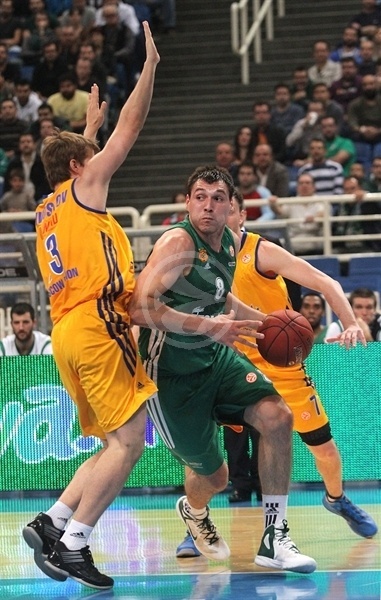 Roko Ukic led Panathinaikos with 13 points. 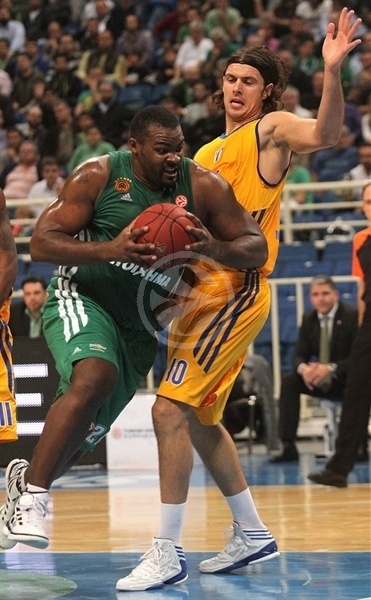 Sofoklis Schortsanitis added 12 and Jonas Maciulis had 11 for the Greens. 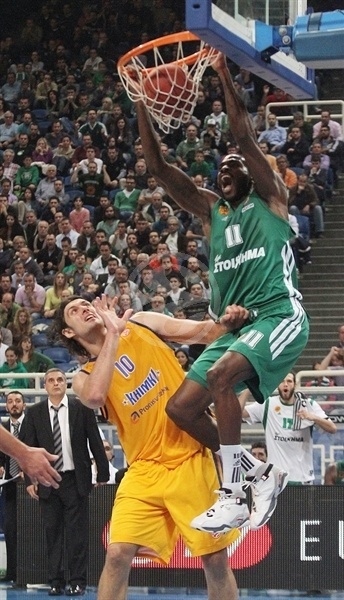 Schortsanitis shined early to give Panathinaikos a 23-17 lead after 10 minutes. Free throws by Kostas Tsartsaris soon put the Greens ahead by double figures, 34-24. 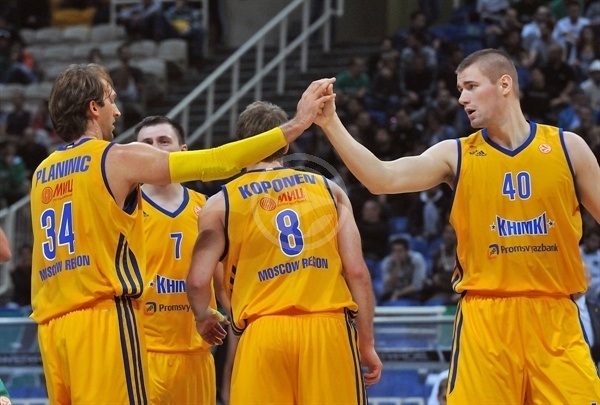 Planinic, Koponen and Davis led Khimki to within 41-38 at halftime. A fast break layup by Planinic completed Khimki's comeback, 43-44. A close basket by Maciulis gave Panathinaikos its last lead, 58-56, late in the third quarter. Koponen and an inspired Planinic fueled a 1-16 fourth-quarter run that sealed the outcome as Panathinaikos never recovered. Gaios Skordilis, a surprise starter for Panathinaikos, got the Greens going with a layup. Sergey Monya split free throws and Kreso Loncar soon gave Khimki its first lead, 2-3. Maciulis struck from downtown for the hosts. Khimki tried to slow down the game tempo. Maciulis kept pacing Panathinaikos with a power layup and free throws by Andy Panko and Schortsanitis gave the hosts a 10-5 margin. 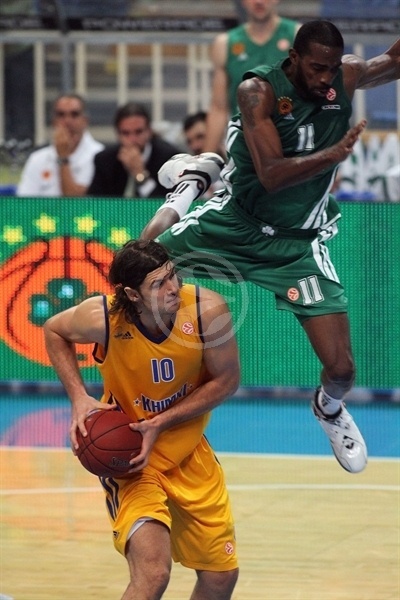 Schortsanitis scored in the paint, but Planinic singlehandedly kept Khimki within 12-8. Panathinaikos kept running its offense through Schortsanitis, but back-to-back baskets by Davis brought the guests a bit closer, 14-12. Schortsanitis split foul shots and Maciulis buried a wide open three-pointer to give the Greens a 18-12 lead. Davis stepped up with a second-chance basket, which Ukic bettered with a three-pointer. K.C. Rivers made 1 free throws and Fridzon added a close jumper to keep Khimki within 23-17 after 10 minutes. Loncar scored down low early in the second quarter and then matched Schortsanitis's power layup with another easy basket. Ukic shined with a driving layup in transition and a turnaround jumper by Mike Bramos made it an 8-point game. Planinic immediately stepped up with a layup, which Derwin Kitchen bettered with a three-point play. Khimki entered the foul penalty really early and Kostas Tsartsaris quickly delivered with free throws. Koponen sank a jumper, however, and a layup by James Augustine caused the Greens to call timeout at 34-28. 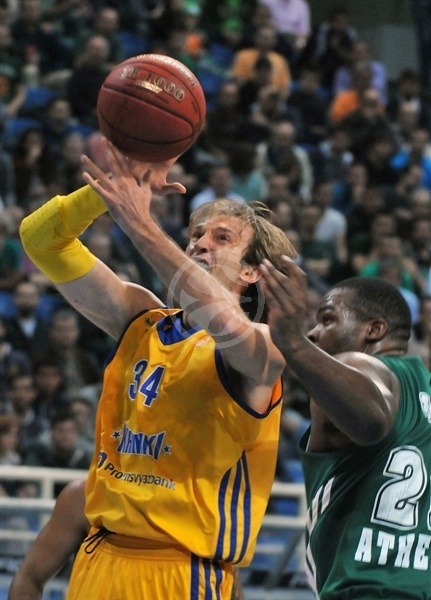 Planinic scored again and Koponen sank a triple in transition to bring Khimki back to life, 34-33. Stephane Lasme shined with a put-back layup and an alley-oop slam, but a three-point play by Davis kept Khimki within 38-36. Augustine made free throws, but Ukic allowed Panathinaikos to reach halftime with a 41-38 margin. Schortsanitis scored in the paint right after the break but Planinic shined with a driving layup and Davis added a follow-up basket to make it a one-point game, 43-42. 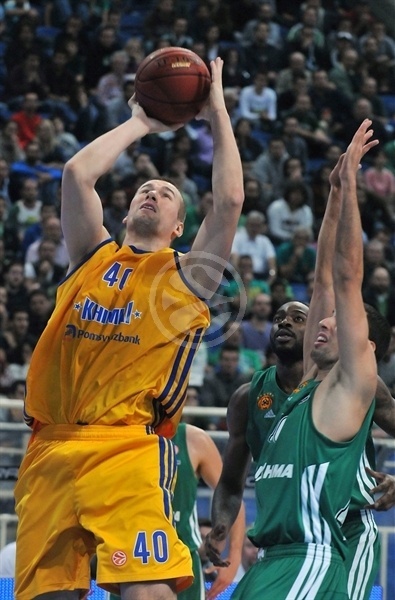 Panathinaikos kept struggling to score and a fast break layup by Planinic completed the guests' comeback, 43-44. The Greens called timeout and Tsartsaris rescued his team with a three-pointer. 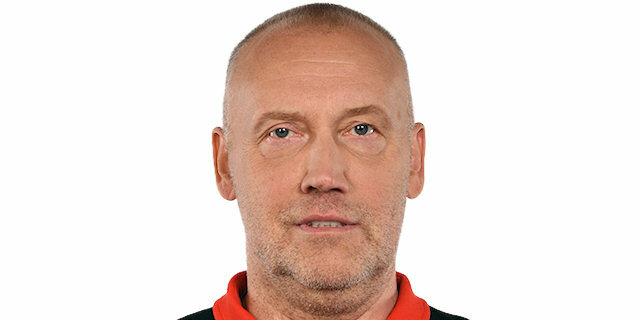 Khimki could not play with the same intensity once it entered the foul penalty. Fridzon stepped up with a layup, however, and Planinic added a wild driving basket to put the guests back ahead, 47-48. Ukic scored in penetration and matched Monya's triple with his own shot from downtown. Skordilis soon added free throws for a 54-51 Panathinaikos lead. Fridzon took over with a three-point play, Lasme and Alexey Zhukanenko traded layups and Maciulis gave the Greens a 58-56 lead. Koponen downed a jumper off the dribble to tie it, 58-58, after 30 minutes. 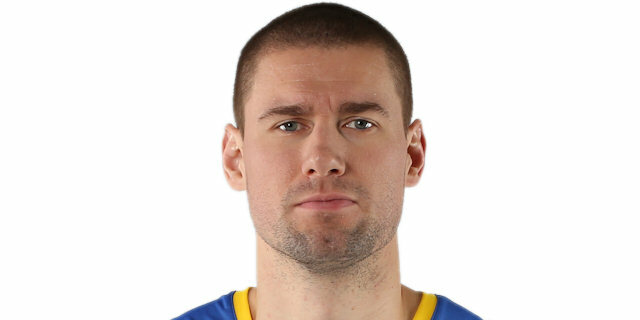 Planinic struck from downtown early in the fourth quarter, as Khimki improved its defensive intensity. The Greens were held scoreless for more than two minutes, while free throws by Loncar and a three-pointer by Koponen forced Panathinaikos to call a much-needed timeout, 58-66. Panathinaikos missed three consecutive shots from beyond the arc before a free throw by Kitchen gave the Greens some hope, 59-66, with six minutes left. Davis dunked and a backdoor layup by Planinic broke the game open, 59-70, with over four minutes to go. Koponen downed a stop-and-pop jumper that capped a 1-16 run, which sealed the outcome, 59-72. Schortsanitis split free throws and Bramos added a fast break layup, but it was already too little, too late for the Greens. Even though Panathinaikos kept fighting, Khimki had cruised to a well-deserved and critical road win. "We played poorly. Khimki deserved to win and so they did. We missed many open shots and free throws , because of the pressure that the whole team and every player feels on individual basis. After three consecutive losses, it is clear that we need a victory in a game in which we shoot the ball well, in order to get our confidence back. We didn't manage to keep our rhythm and Khimki is a good team and they took advantage of all our mistakes and weaknesses." 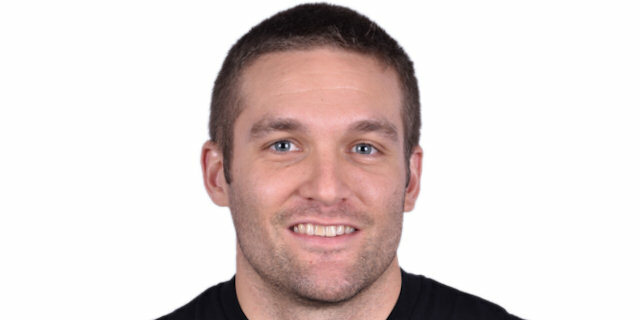 "I am very happy for this win over a team with great history in basketball. Panathinaikos has changed a lot this season, but they are still strong. I want to thank my players for their efforts in the whole game. Although we were trailing by 10 points, we found the power and the character for the comeback. In the last quarter we played fast, we shot at a high percentage and we dominated on the court." "I can’t explain what is happening here. I don’t think that we were influenced by the unexpected loss to Ikaros in the last game in the Greek League, but the problem is still here. We lacked energy and offensive solutions and suffered a collapse in the fourth quarter. However the show must go on. We have to return in the practice to work hard and to fix our problems." "It was not easy to come here and win, after our team has lost eight straight Euroleague road games. 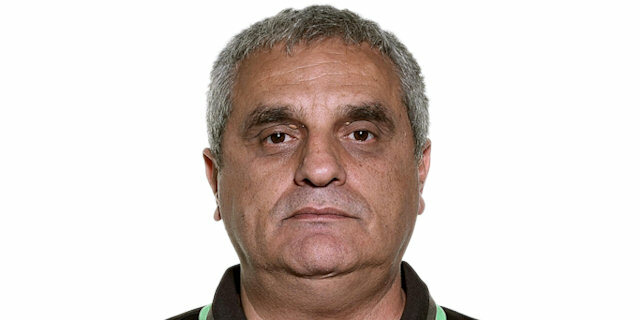 Panathinaikos is a great team, but its roster is new and probably need time to make the adjustments and find the chemistry needed. We were needing this victory and I hope that it will help us to go ahead. The key for our success was that we reacted and didn’t allow our opponents to open a bigger margin when we were trailing by 10 points. We fought for every ball and took advantage of any opportunity."